Observer in usability testing gets actual insight of the users while watching them using a product. But what about the users using adaptive technology? like blind web users, how blind users work with web sites? While surfing net, I found a very good case study where 16 blind users were observed while using screen readers to do some tasks on different web sites. Here I am briefing the main points of the same. Most blind users are just as impatient as most sighted users. They want to get the information they need as quickly as possible. They do not listen to every word on the page – just as sighted users do not read every word. They “scan with their ears,” listening to just enough to decide whether to listen further. Many set the voice to speak at an amazingly rapid rate. They listen to the first few words of a link or line of text. If it does not seem relevant, they move quickly to the next link. 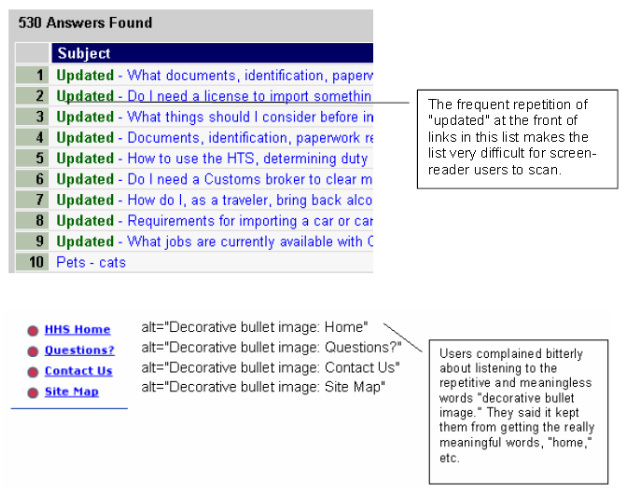 Blind users also object to listening to descriptions of elements, such as decorative bullets that add no meaning to the page, and that make them wait through three words to get to the real meaning. Write for the web. Write in short, clear, straightforward sentences. Write links that start with keywords. Use empty ALT text, ALT=”” or use a space as ALT-text, ALT=” ” for decorative elements on a page so that users do not have to listen to “decorative bullet image” or “decorative line.” Using empty ALT text for decorative elements complies with 508 guidelines. When links are bulleted, there is no need to identify the bullet, just the link name. Screen-reader users have already quite a mental load to understand the browser, the screen reader, and the web site. Most screen-reader users do not use the mouse. They completely depend on keyboard commands. It need to be taken care by the developer of screen-reader to make the command memorable and intuitive. Designers and developers of websites should make the structure clear and obvious to decrease the cognitive load of not only blind users. It helps the sighted users as well. Screen reader software does an amazing job but still we need to take care of small things to make the content clear and obvious for the blind users. here are a few guidelines that need to be taken care. Provide a link “Skip to main content” many users want to skip the navigation. Off course it doesn’t make sense to listening to the global navigation at the top of every page before accessing the main content. Navigation is a web jargon, which is understand by software professional and highly sophisticated computer users. Text which make more sense for the user is “Skip to main content” It is much more meaningful for the user. Web sites are made up of navigation pages and destination pages. Pages that are primarily used for navigation, sighted users often scan the page, focusing on the blue underline. Blind users are no different. They move the same way. Screen readers assist them by allowing users to choose to listen only to links. Both JAWS and Window-Eyes users can do this by either tabbing from link to link or by calling up a Link List, a separate window that lists all the links on the page. By using the link list users move quickly through the list and blind users use this regularly. They scanned the link list with their ears – even through the link list. They get frustrated, if the link start with same words. That’s why links like “Click here”, “more” and other meaningless links just do not work. Try not to have many links that start with the same word or phrase. Some vision-impaired users spell poorly, which make successful searching difficult. Use search engine that provides help with spelling. Even most sighted users don’t read. They scan the content pages. Most screen reader users also want just the section that has the information that they need. 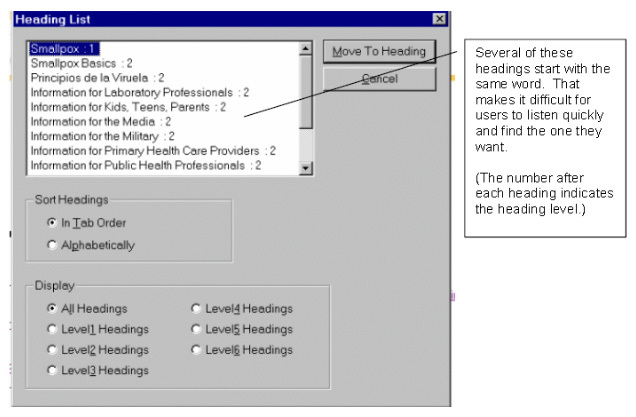 JAWS allows them to skim through a document as sighted users do, moving from heading to heading by pressing H or using Insert-F6 to get a Headings List (just like a Links List). Encourage authors to use many headings in their content and to be sure that those headings are clear, meaningful, and parallel. etc. JAWS looks for the heading tag. Put the keyword at the beginning of the heading. If many headings are about the same thing, differentiate them in meaningful ways. After understanding how blind users use the web site. Usability and accessibility go hand in hand, there is relationship between accessibility and usability. There are already guidelines that helps to make website accessible but by just following the guidelines. It doesn’t sure that a website is usable for the blind users. Such research based guidelines help a lot. I have brief here some important point. To get more insights read this case study, it really worth your time. I agree with the first part about words that have no meaning in the front of lists, but it all depends on the context. For example the “updated” word example given, it may be data that the user should hear in their screen reader. With Gmail, it should say “read” or “unread”, which is a very important detail that needs to be read out by the screen reader. Unfortunately Gmail does not include this in the line so when you mouse over with ZoomText it doesn’t tell you if it is read or not. If you can navigate a page with your keyboard (using tab and up/down arrows), then it’s not going to take much to go the distance to support usability. I found ZoomText and Gmail quite frustrating, I’m not sure how a visually impaired user can use Gmail effectively. I couldn’t figure out how to tab to the list of email messages. Logic would think you would be able to tab to the messages then arrow up/down on them. Hopefully I was missing something. I tried IE11, Chrome and Firefox and could not easily navigate Gmail with just the keyboard. I now design my sites responsively and test using lynx (command line web browser). If I was blind or visually impaired, I would use lynx as much as possible. A very informative article. However, i feel usability needs to be taken to the next level for such part of world population at least in case of Smart Phones. User Experience professionals need to treat the visually impaired people same as normal people and provide a best possible user experience as a whole. For e.g. A voice guided mode on Smart phones might be a boon to visually impaired population. Next Next post: Mental model and conceptual model in user experience.